Only $50 when added after choosing your inflatable rental! Imagine sand art made with candy powder instead. That is Pucker Powder! This six flavor dispenser comes with both sweet and sour flavors and all of the tubes that your guests will need to create their own edible candy art. With a little adult supervision, this concession item will be a fun, easy and non-messy project for both children and adults. This machine will do great at birthday parties, festivals, picnics, carnivals and fairs. It is both easy to do and super fun. 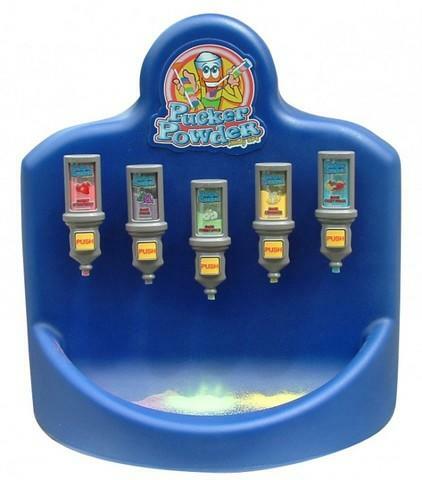 So get to creating some edible art and turn your birthday party or event into a classic carnival with our pucker powder machine rental! Also, check out our other great fun food & concession machine rentals. Jump 2 It Party Rentals is located outside of Atlanta, in Newnan, Ga and services Atlanta, Peachtree City, Newnan, Fayetteville, Carrolton, Tyrone, Brooks, Senoia, Riverdale, Jonesboro, Douglasville, Palmetto, Sharpsburg, Union City, Griffin and the rest of the Atlanta metro area for Cotton Candy Machine Rentals.